Every time we write about gadgets to monitor our eating over on our sister site Connected Health we joke that you’ll still need a healthy dose of motivation whatever you start using, because no matter how clever a device is it can’t knock that HUGE tub of Ben & Jerrys out of your hand. Well, that’s not necessarily the case anymore, as the HAPIfork alerts you when you’ve eaten too much. 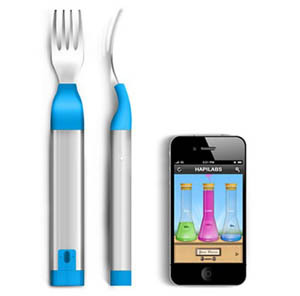 Using a variety of sensors the HAPIfork is able to monitor how fast you’re eating and then vibrates if you’re gobbling your meals down too quickly. It’s then really clever as it increases the length of time between each mouthful, so you effectively eat less. Or just eat loads and ignore the vibrations – we’re not too sure? !